The media hates the millennial generation. And it loves to publish negative stories about them. Until last year, the media said that millennials were going to live in their parents’ basement forever. Now, millennials represent 45% of all home purchases. Then, the media said that millennials made so little money that they couldn’t afford anything. Wrong. The average income for the oldest millennial age group is nearly $40,000. Next, the media told you that millennials are clueless about money. Wrong again. Research from Principal Financial Group, a major financial services company, says otherwise. Its data shows that millennials save more. They are wise to Wall Street’s crookedness. And they are starting young with plans for their retirement, and are careful with big-ticket items like houses and cars. Now, there’s one thing the media is not telling you about the millennial generation. And if you don’t know this, you’re going to miss out on massive gains in the stock market. You see, despite all these headlines, the future of the U.S. economy and generally the world belongs to the millennial generation. You can see that clearly from the chart above. Today, the oldest millennial is 35 years old. Each year from now, they are becoming a larger percentage of the population. 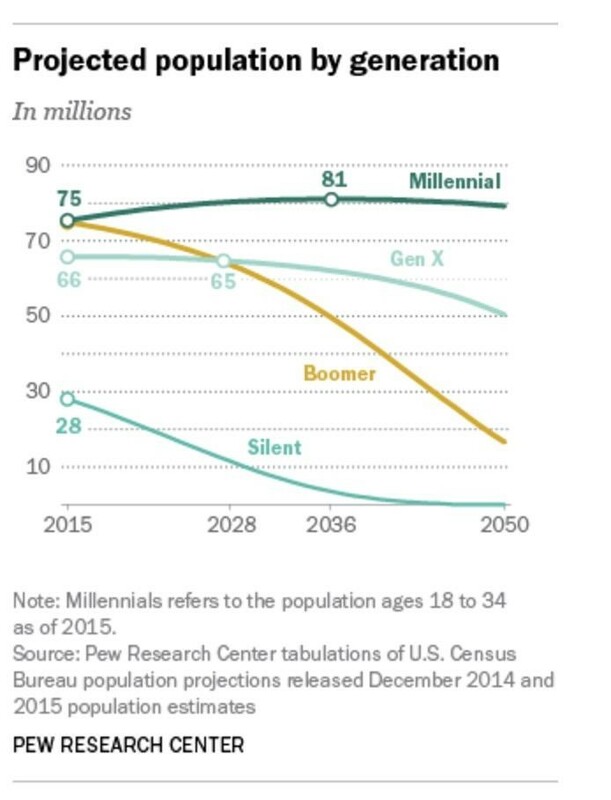 Over the next 15 years, millennials are going to completely and utterly dominate demographics. That means their preferences, habits and ways of doing things. These are going to become the default. You’ll see every business, every organization change. And the companies and organizations that don’t change will run out of customers and go bankrupt. Right now, negative stories about millennials dominate the headlines. Many of you may believe these headlines. You know: the ones that portray millennials as spoiled, entitled and lazy. Truthfully, this is opposite to my personal experience. I count many millennials as my colleagues and friends. They are smart, hardworking and eager to make their mark on the world. In the end, your or my opinion of millennials is meaningless. What does matter are sheer numbers. At 92 million strong, the millennial generation is going to redefine every part of the U.S. economy. This is why I focus my investments in my services on the new. New technologies. New products. New services. This kind of shift happens only once every 100 years. That’s because you have to have a major generation coming of age alongside new technologies. Young people are more open to new things. So, new technologies become successful. This is why you hear me telling you each week about something new. The Internet of Things. Gene-based precision medicine. Mobile payments. Electric self-driving cars. Organic and local food. Renewable and sustainable energy. Outdoor recreation. Without millennials, these new things might never be successful. However, waves of the millennial generation are coming of age for the next 25 years. This is why every stock that I select has products and services that appeal to the millennial generation. Without millennials’ sponsorship of a company’s product or service, that company is going to fail. That’s because with each year that passes, every single company is going to be counting on the millennial generation more and more for their growth.